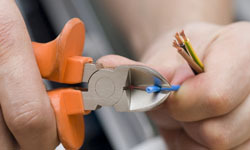 If you are looking for London electricians, then you have come to the right place! Trying to fix an electrical fault without a sufficient electrician’s qualification, or any experience can be a risky job. When not done correctly, even simple wiring jobs like changing light switches or wiring a plug, can lead to dire consequences. Therefore, you should always hire professional electricians in such situations. My London Builders has a team of class A and class B certified electricians specialising in all types of electrical repairs and electrical installations for both commercial and residential properties in London. Our technicians can install, maintain and operate all kinds of electrical appliances and gadgets. Regardless of the nature of the task, our electricians will make sure that the job is done the right way. If you’re looking for the best London electricians in the business, you’ve found them! At My London Builders, we think your convenience and your time are important, so we do everything possible to make sure that the job is completed as soon as possible, without sacrificing quality. Matching speed with quality is something very few London electricians can maintain. It’s something we train all our trades to do, and something we’re renowned for in the area. We also strive to cause minimum inconvenience to your routine while the work is going on. That means working quickly, tidying up after ourselves and respecting your space and your property. We appreciate that having builders in can be something of an inconvenience, so we make extra sure to stay as out of the way as possible. Our dedicated electricians have years of experience in electrical services and maintenance. Equipped with state of the art tools and equipment, they can identify the faults on the spot and fix them instantly. They can also handle routine maintenance of all your electrical installations to help you avoid costly repairs and breakdowns in the future. At My London Builders, you are sure to get the best possible service at affordable rates. Our name is synonymous with quality and reliability. It is our undying commitment to customer satisfaction that has earned us a large base of loyal customers. In short, if you are in search of London electricians, you need to look no further. Remember that electrical work is a major aspect of any building construction and you need to hire the best electricians to take care of it. All our tradesmen are qualified and experienced. They are also fully insured to work on residential and commercial properties. All our work is guaranteed, and we have a list of satisfied clients you will be welcome to contact for references. For the best London electricians in the business, call My London Builders today!